Home stretch to the playable demo! The Hungry Ghost will seek out and consume any items it finds. If not, then it will just wander around the maze aimlessly. The Vagrant Ghost prioritizes shelter over hunger. It slowly drags itself towards the shelter or jail. Once it gets there, it will enter the shelter/jail and scare away/release two spirits (who go back into reserve), disappear for a while, then respawn to repeat the process. The player can shoot the Vagrant Ghost to temporarily chase it away from the shelter/jail. This guy, the Vile Ghost, is new. Like the Hungry Ghost, it will seek out items and consume them. However, unlike its gluttonous cousin, it will chase after the player if it can’t find any items. They are mainly found in Pohena rounds as an implacable danger much like evil spirits are to Donum. The good spirits’ slowing effect on Pohena makes it easier for the Vile Ghost to catch up with her, so better stay away from all of them. Implemented a “three strikes” system in regards to shooting good spirits. If the player (as either character) shoots a good spirit, they will be penalized: -500 points for the first offence, -1000 for the second and one life for the third. The strikes reset whenever the player loses a life. The only thing the game needs before I release it as a demo are additional mazes and data dictating what spirits and preta spawn for each round. The end is in sight! I was playing my 3DS and decided to start up Petit Computer again. For those not familiar with it, Petit Computer is a BASIC programming environment for DSiWare that is geared towards making games on your DSi or 3DS. As I was going through the saved programs, I came across the only game I made on it, Debugging. It is also the first game that was branded under “Quadolor Games“. I figured that I would create a page on this blog for it; you can find it here. The ROM Game Jam is over and my team, Robots Mashing Keyboards, actually managed to create a fully-functioning game prototype by the deadline. The fruits of our labour is Rise & Fall, a 2-player dueling action game based on two ancient cultures (which was the topic of the jam). …who fight by launching projectiles at each other. They each have four broken artifacts on their side of the arena. If either player gets hit three times, they “die” and the opposing player gets a point. 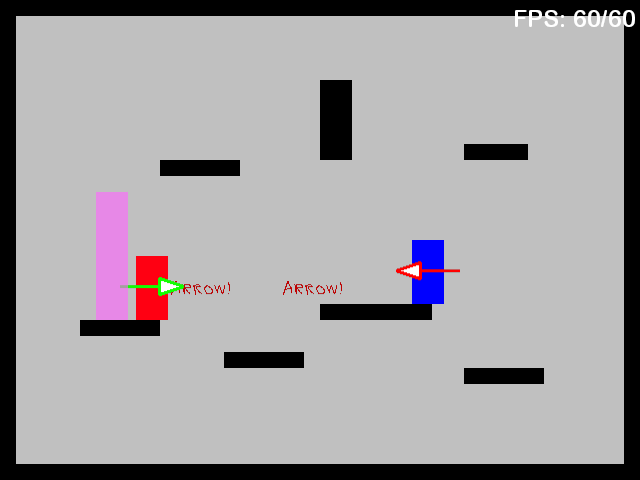 Each point half-fixes one of the player’s artifacts. In the picture below, the pottery on the Roman (left) side is half-fixed. When an artifact is fully repaired, it can interact with foreground objects, i.e. 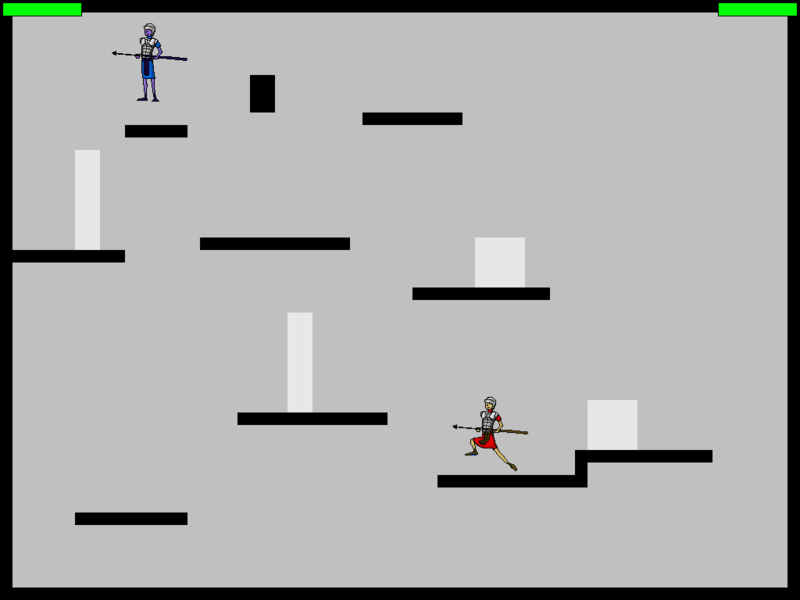 players are impeded by and can stand on it and it can block projectiles. When an artifact is fully repaired for the first time, it’s name pops up on screen so you’ll know what it’s called and you can recognize it when you see it at the Royal Ontario Museum (that was their idea, by the way). …and the ninth point from the “coup de grâce”. To the victor, goes his/her soldier running across the screen. Computer keyboard masher (Programmer): M.S.T.O.P. Electronic keyboard masher (Music and sound effects): M.S.T.O.P. Oh man, today was a tiring day, I didn’t even have the extra energy to use Twitter to document my team’s process. Not to mention the confusion and delay when I was taking the subway to the ROM. Oh well. It’s too bad I’m not able to show you a video; the sprite animations and foreground objects are coming along nicely. 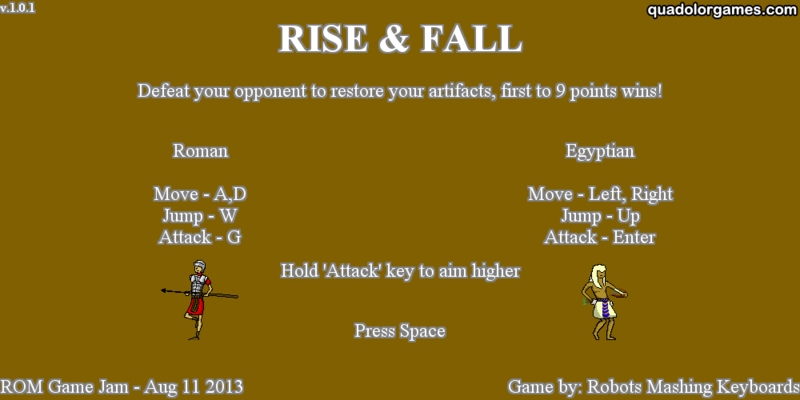 As you can see, we have a Roman guy and Egyptian guy dueling each other. The Roman throws spears pilums (the archaeological experts at the ROM said the latter was more historically accurate) while the Egyptian shoots arrows. They fight each other to restore their own ancient culture’s artifacts for some unexplained reason and in some unexplained manner. This has baffled and intrigued archaeologists for many minutes. Tomorrow, we’ll finish off the rest of foreground objects, the backgrounds and whatever is left over (well, we have to since it’s the final day). ROM Game Jam Day 1 – The internet wouldn’t allow it. Normally, I wouldn’t update my blog in the wee hours of the night, but the lack of a good internet connection at the ROM Game Jam has forced me to. I won’t go into details right now, but let’s just say our game will be a 2-player competitive platformer. 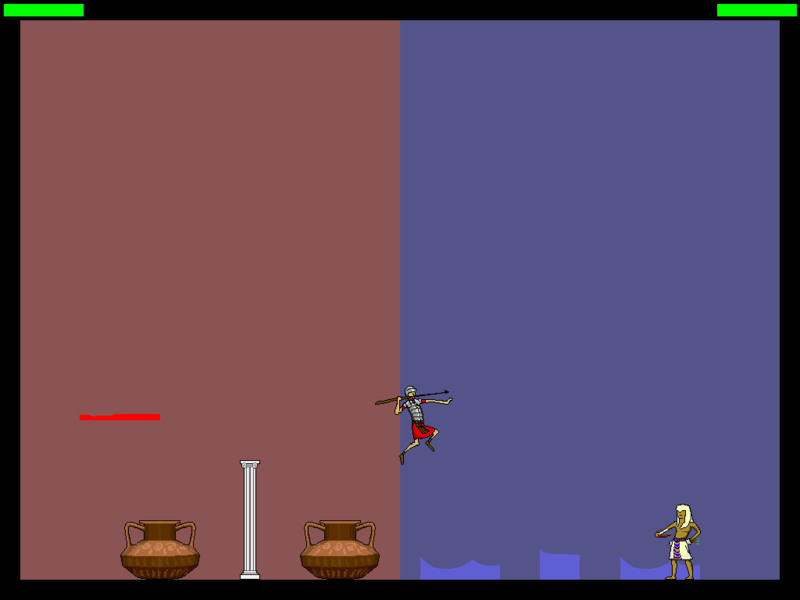 Next is a screenshot of a later build of the game, featuring graphics for one of the two characters in the game: some Roman guy, done by team member Shmuggly. The video doesn’t do the run cycle justice; it looks much better (and funnier) at 60 frames per second. The background music was composed by me, hastily over the course of only a few days and still needs a bit of work. Still, I’m actually impressed with how it turned out. When was the last time I even did anything in 3/4 time with the harmonic minor scale? And now I’m tired, and have to get up early tomorrow to continue jamming. Good night everybody. The ROM Game Jam official starts at 4 PM today. I’ll try to update you on my progress either here or on Twitter, if the internet will allow it. Congratulations! Your game has evolved into Alpha! Up until today, Gonna Catcha was nothing more than a collection of protoypes, loosely connected together and couldn’t work together as a whole game without changes to the hard code. There’s more to Ghost Month and the Ghost Festival than that, but I’ll save it for another day. Also, the ROM Game Jam is next weekend; I need to brush up on my HTML5 GameMaker skills. P.S. I updated Gonna Catcha’s info page with a new screenshot and the video above.